This is the AIMS Power Battery Temperature Sensor for the Low Frequency Inverter Charger models only. This allows careful monitoring of the batteries for extended life and longevity. The sensor plugs into the inverter and the other end is attached the the battery (s) and provides battery temperature information. The cable reaches up to 32′. AIMS Power 4000 Watt Pure Sine Low Frequency Inverter split phase with built-in battery charger and transfer switch. This inverter charger is perfect for medium-sized industrial applications that depend upon power being available even under heavy load. This heavy-duty inverter charger is ready to go wherever you need it. Use this product for renewable solar, off-grid, business back up power, mobile and emergency backup power applications anywhere that uses 100/110/120/220/230/240 volts of alternating current. This product also has auto frequency detection that allows users to operate at either 50 or 60 hertz. 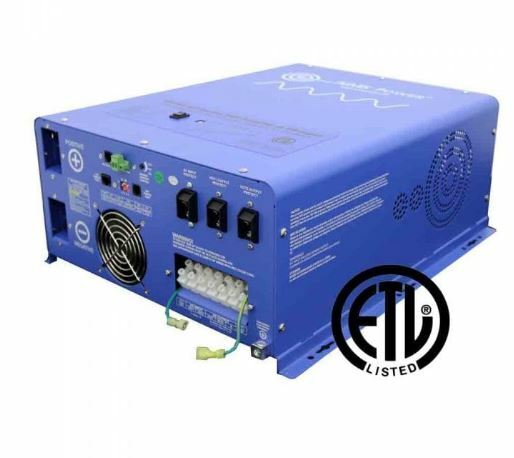 This AIMS power inverter charger includes a powerful 55 amp charger and is capable of accepting any source of 240V AC power to charge batteries, including a gas or diesel generator or shore power. The 4000 watt inverter charger is capable of a 12000 watt surge for 20 seconds and can run at 4000 watts continuously. This inverter will never completely drain your batteries as it’s low-voltage shut-down keeps the voltage at either 20 volts or 21 volts depending on your selection. With the battery priority mode, you can set your inverter to run directly off of a battery back-up system instead of a generator or tertiary source of AC Power. The inverter charger comes with a power saver mode that pulses every 30 seconds, attempting to detect a necessary load of 25 watts or more before it will turn on. Otherwise, the inverter will “sleep” and draw right around a half an amp per hour, saving you precious reserve power in your batteries until you need it.